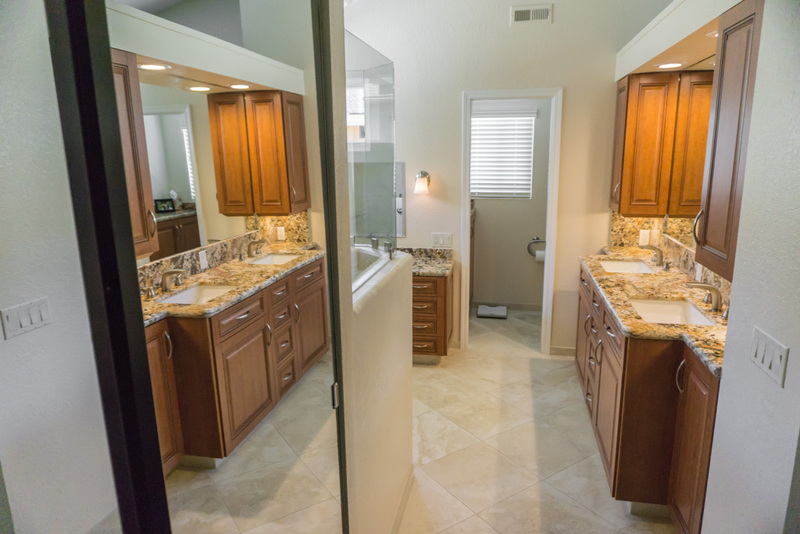 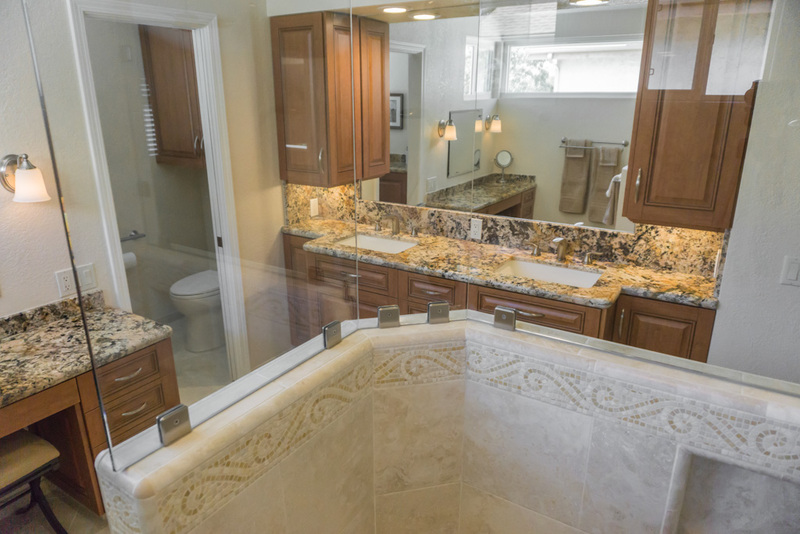 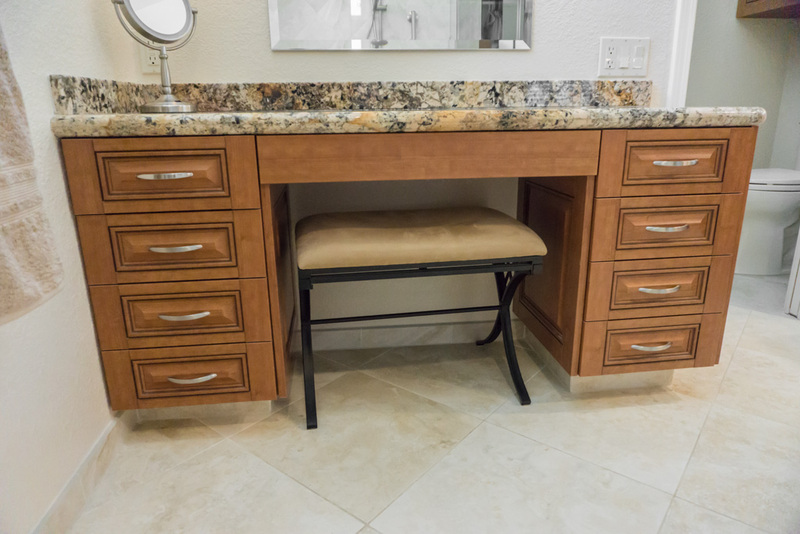 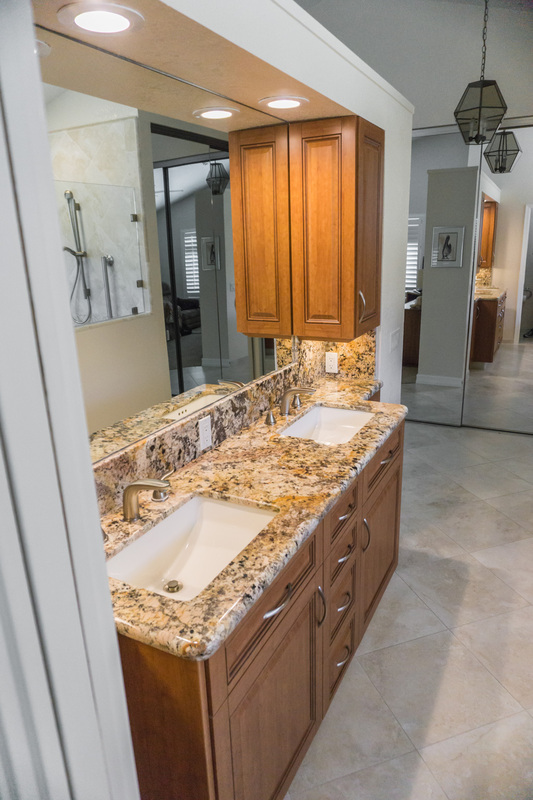 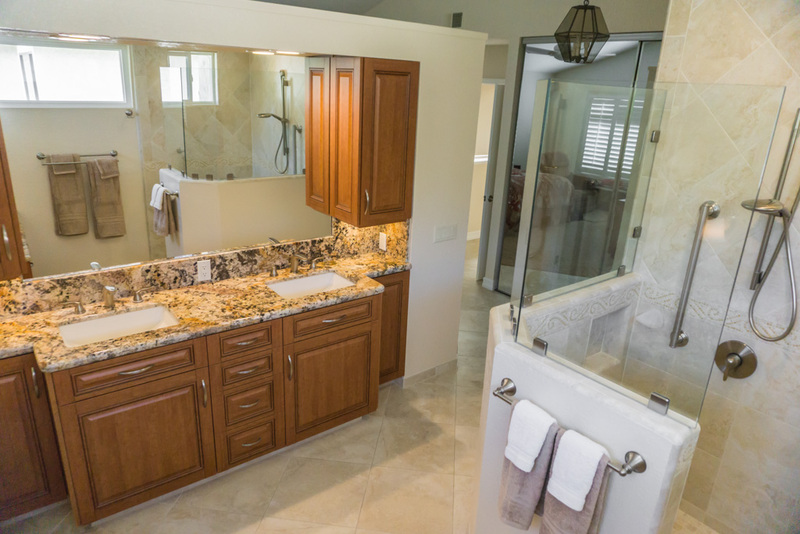 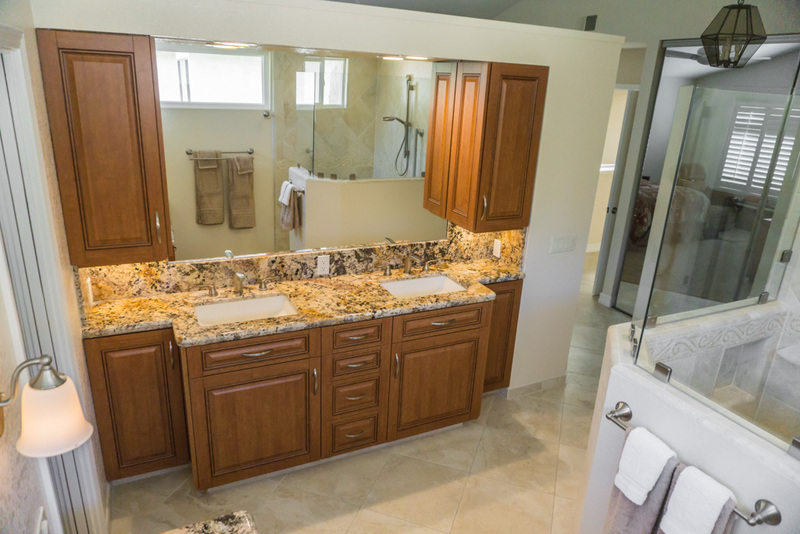 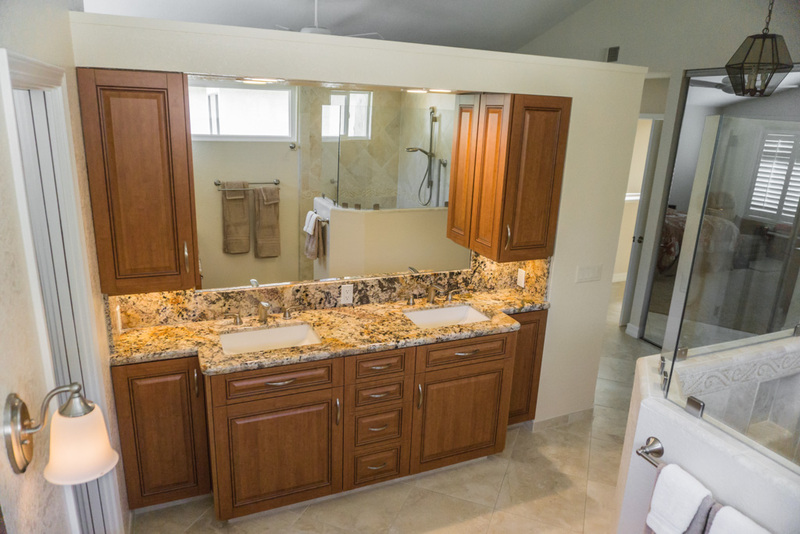 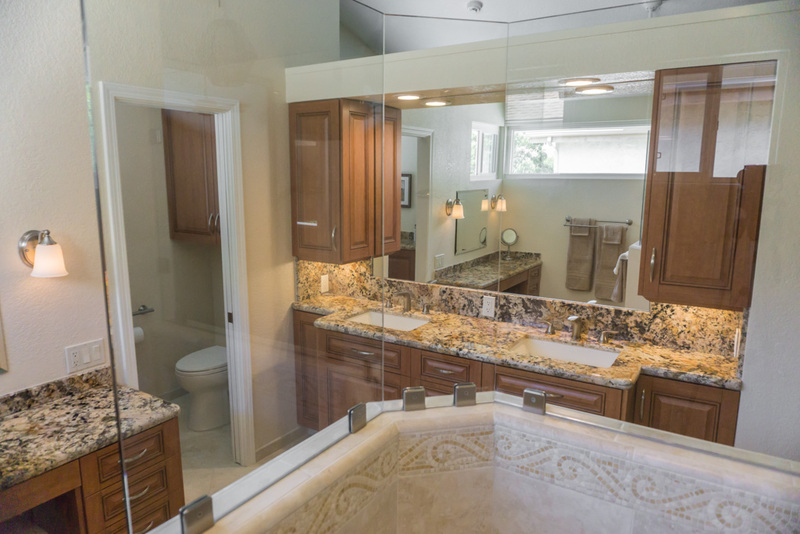 The focus of this project was to upgrade the builder-grade master bath and cosmetically update two other baths and some hallway storage cabinets. 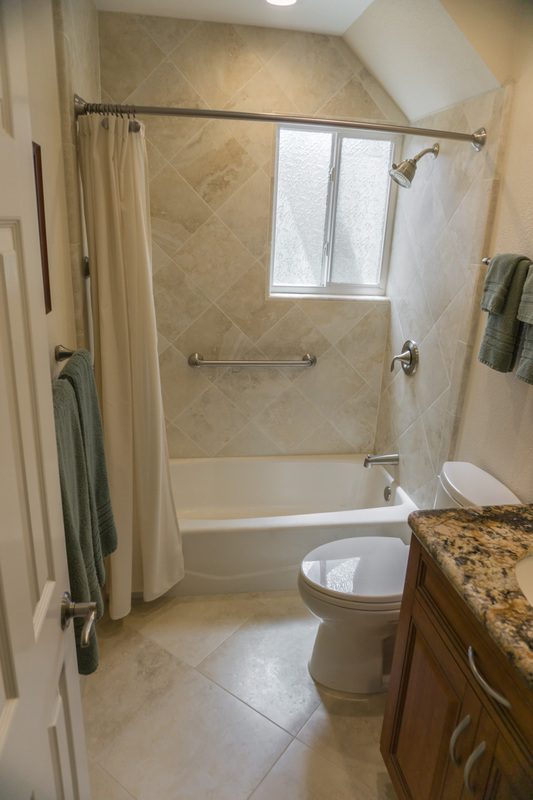 In the master bath, we removed a tub they never used in favor of creating a much larger walk-in shower and a sit down vanity. 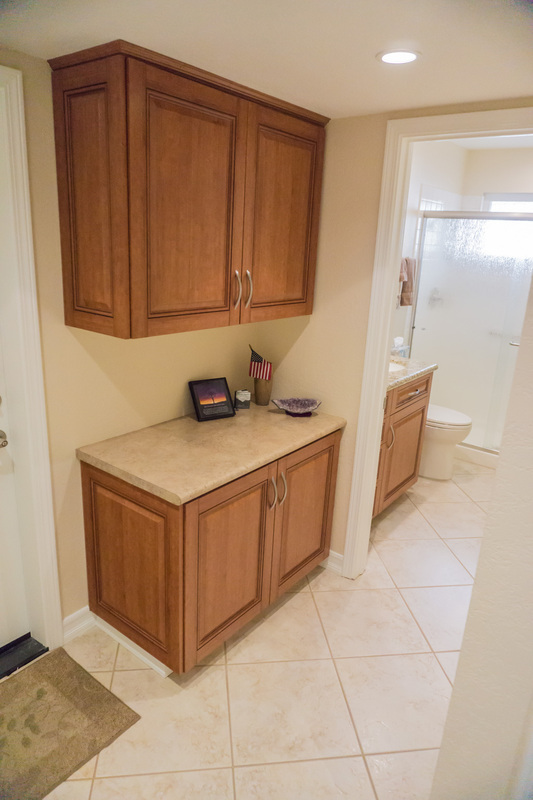 We also reworked the main sink area to fit our functional bath design concept of added storage next to the sink grooming centers. 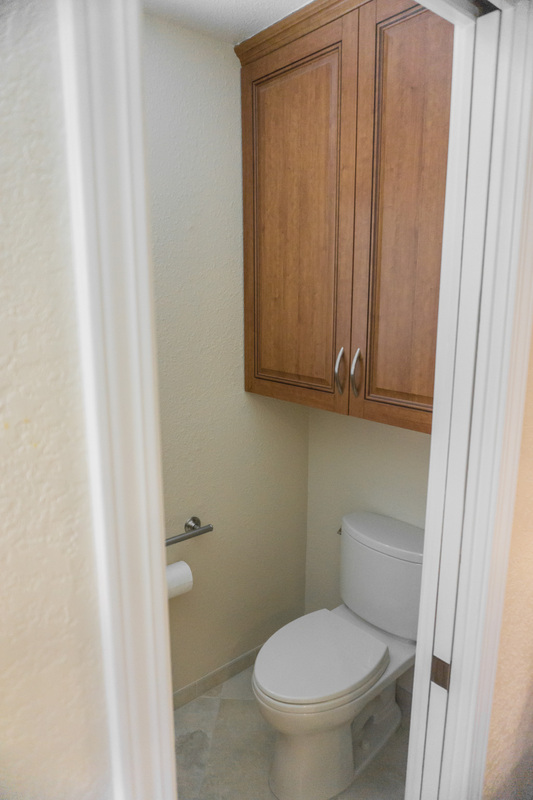 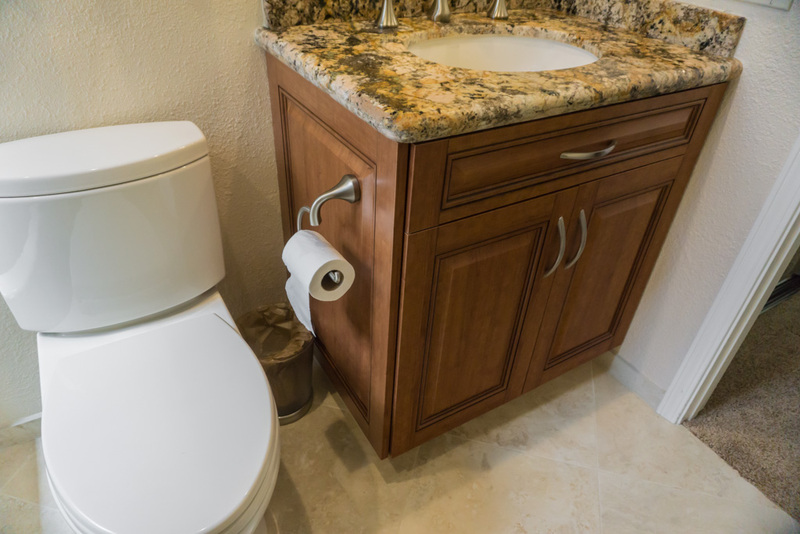 We also added some storage cabinets to the existing toilet room and changed that room’s door from an in-swing to a pocket door to make those new cabinets and toilet more easily accessible. 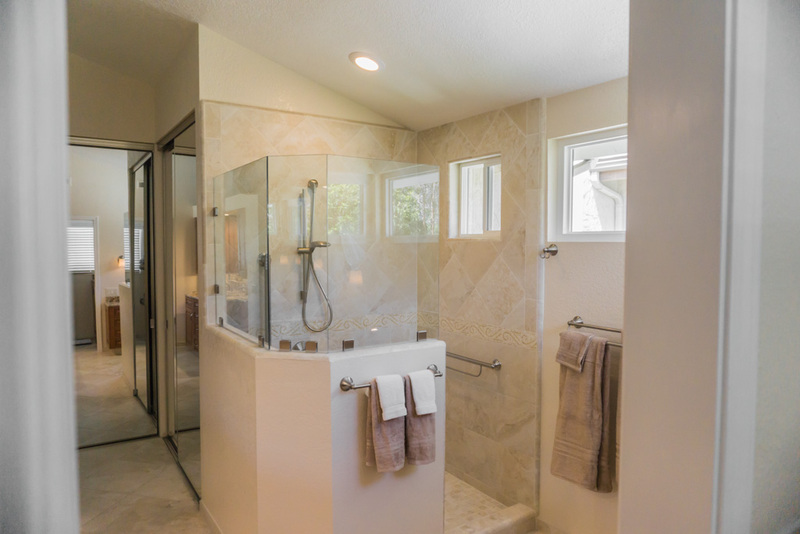 The new shower has a half wall with fixed glass panel on top for two reasons. 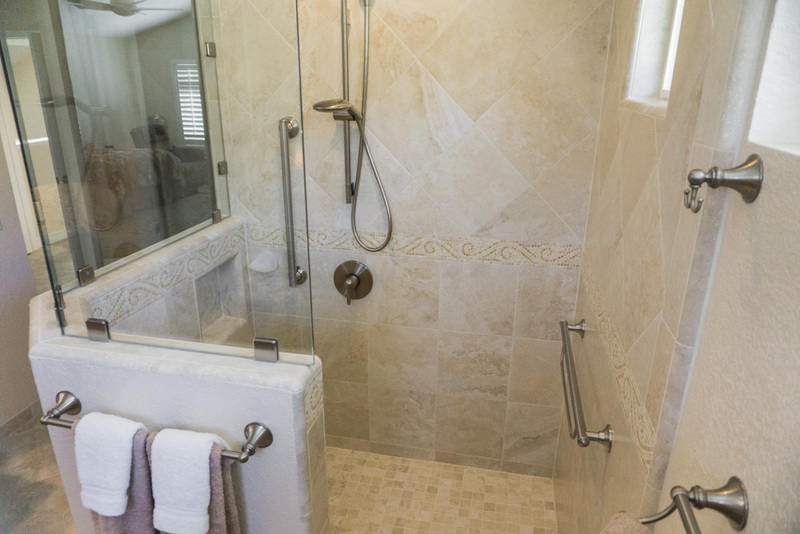 The walls are more easily water proofed with longer lasting tile than glass seals for keeping water in the shower and never leaking. 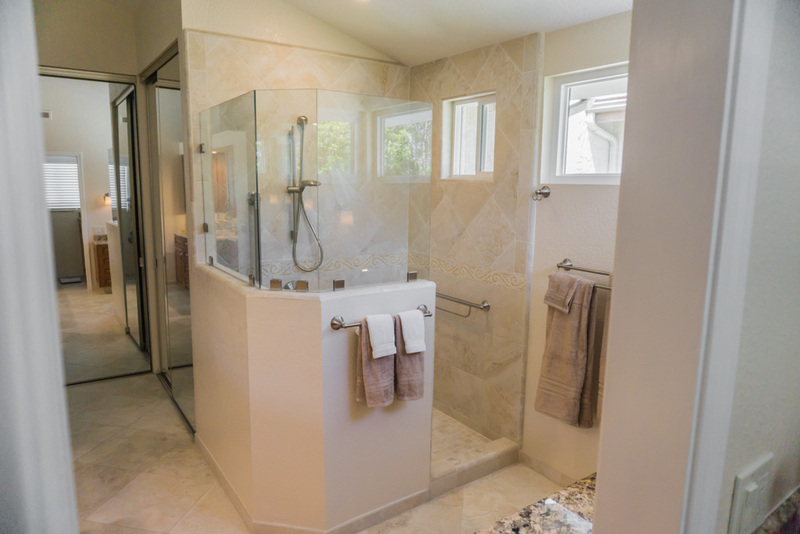 Those same walls connect to a seating area and hide the recessed shampoo storage from view outside the shower so all that is seen from outside it the tile design. 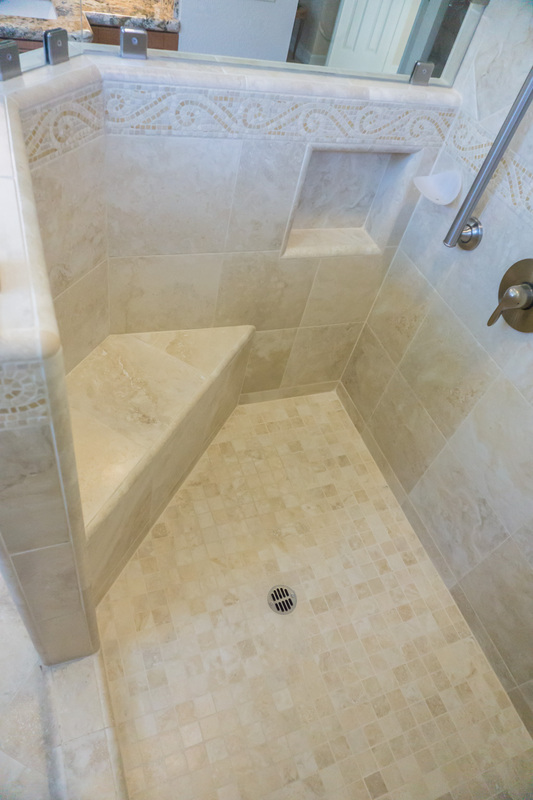 The glass because it now starts at 44″ off the floor receive very little water and is far easier to keep clean than the old traditional style of glass to the shower floor or dam. 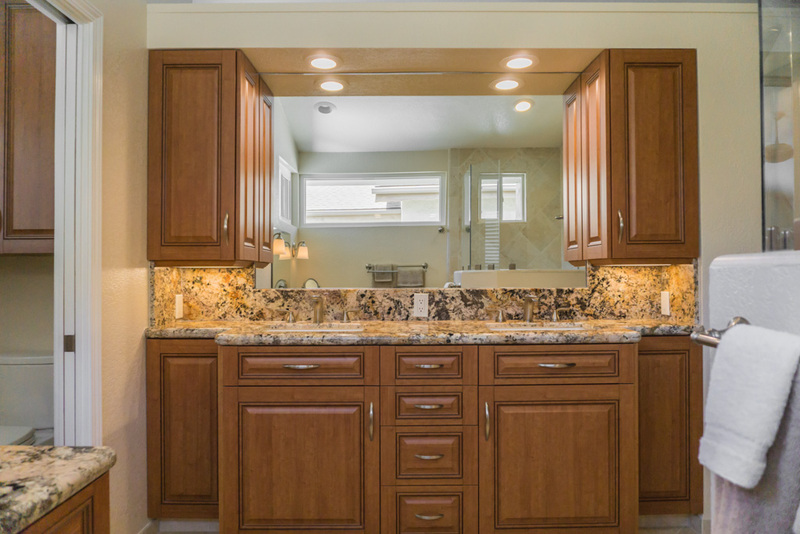 The cabinetry on the entire project have 5 piece glazed cherry thermofoil doors that look exactly like real wood doors. 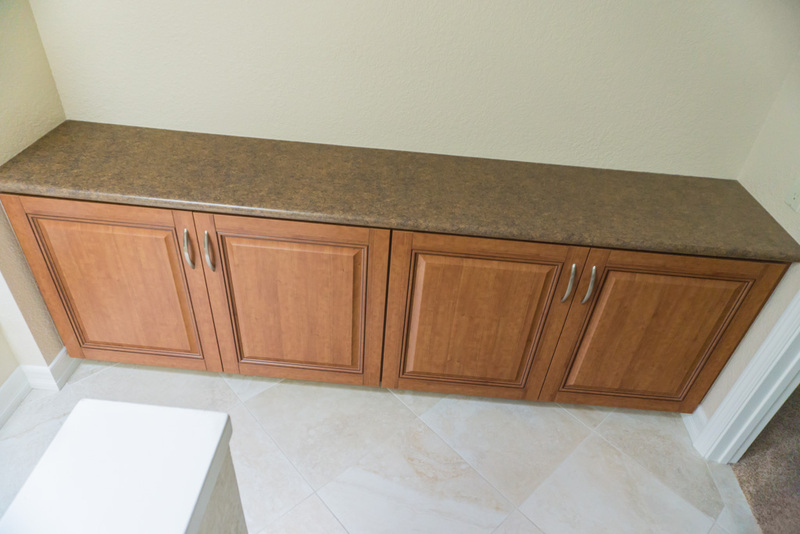 When I brought door samples for the clients to choose from, I put the thermofoil sample next to a real cherry wood sample and the client picked the thermofoil as their first option without realizing it was not real wood. 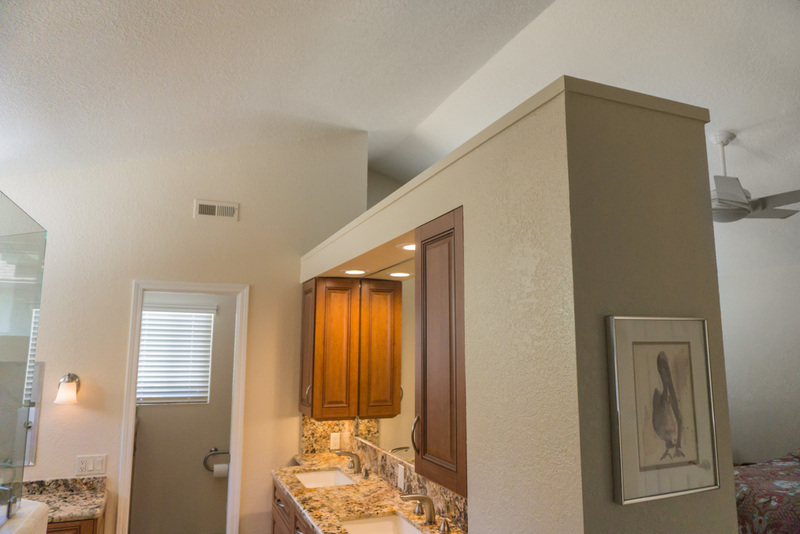 When they saw the costs saved compared to real wood and learned thermofoil’s increased durability factor over real wood, the choice was a no brainer for them. 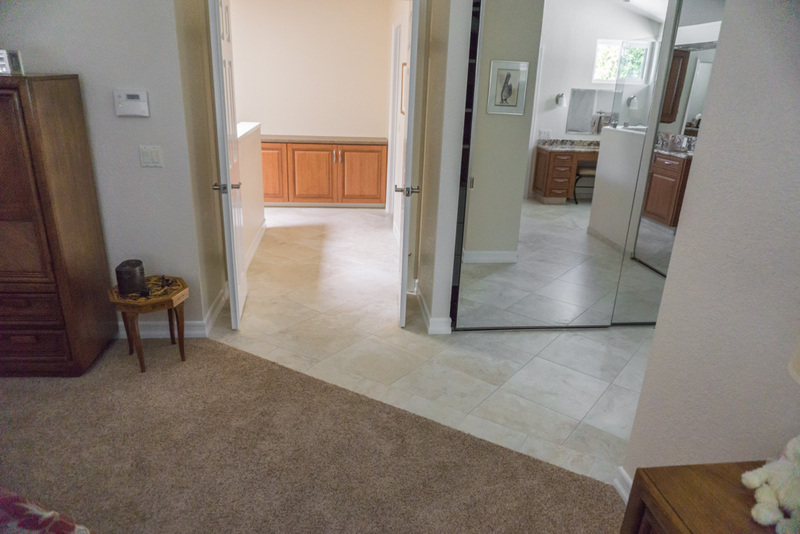 In fact, the money they saved on this door selection over real wood bought them all their new plumbing fixtures! 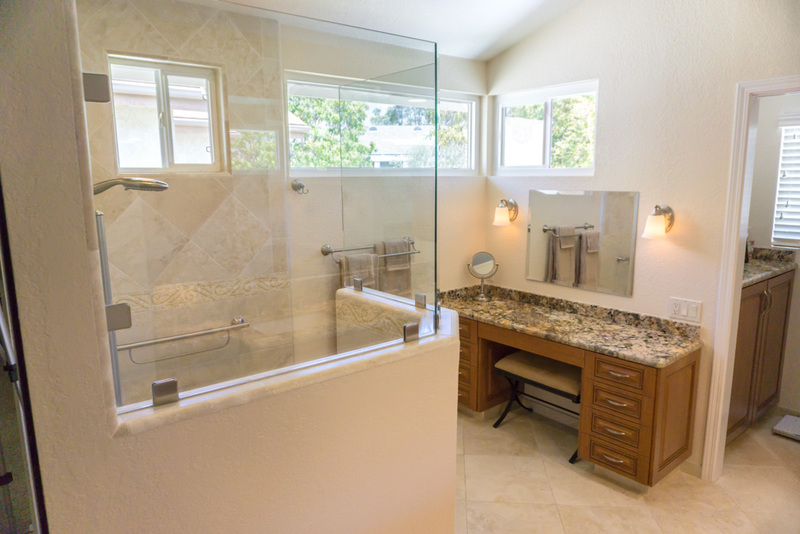 The master bath was open to the bedroom by way of a wide door-less entrance, as well as an 8 ft. tall wall under the vaulted ceiling over 12 ft. tall shared by the bath and bedroom. 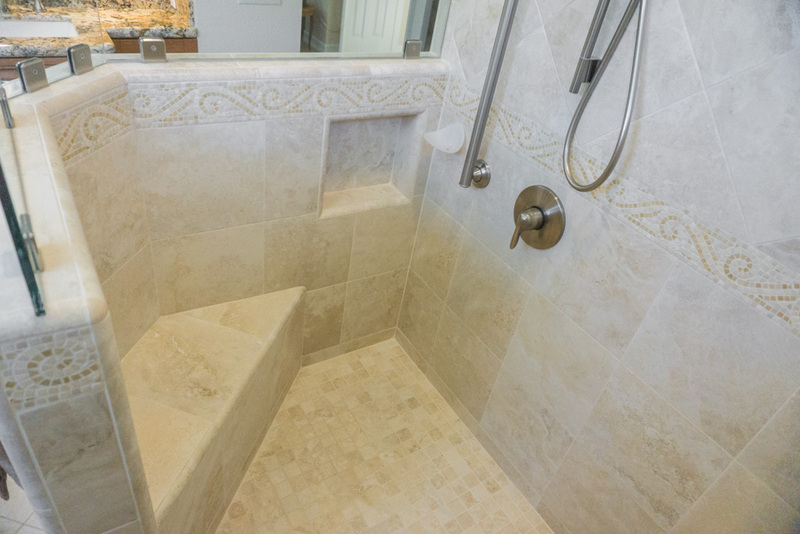 This open room greatly reduced the need for any mechanical venting in the bath since it is connected to such a huge air volume. 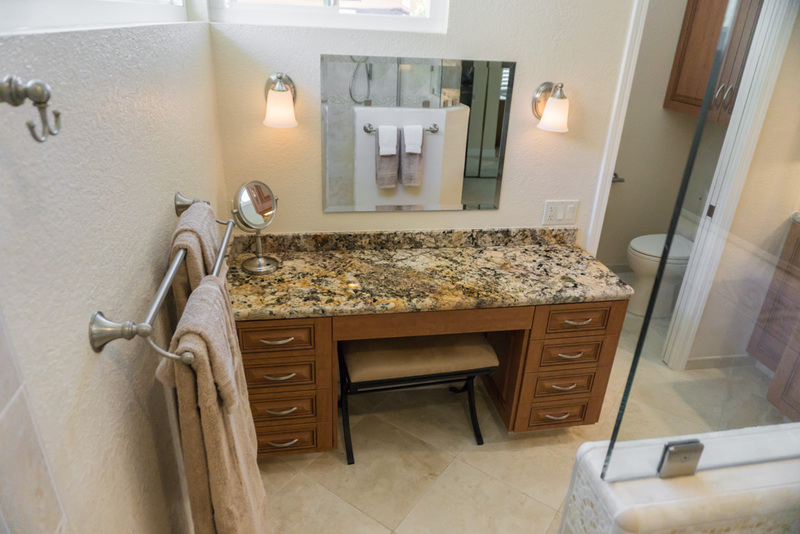 This client had also lived here for years with no buildup of water on mirrors while showering. 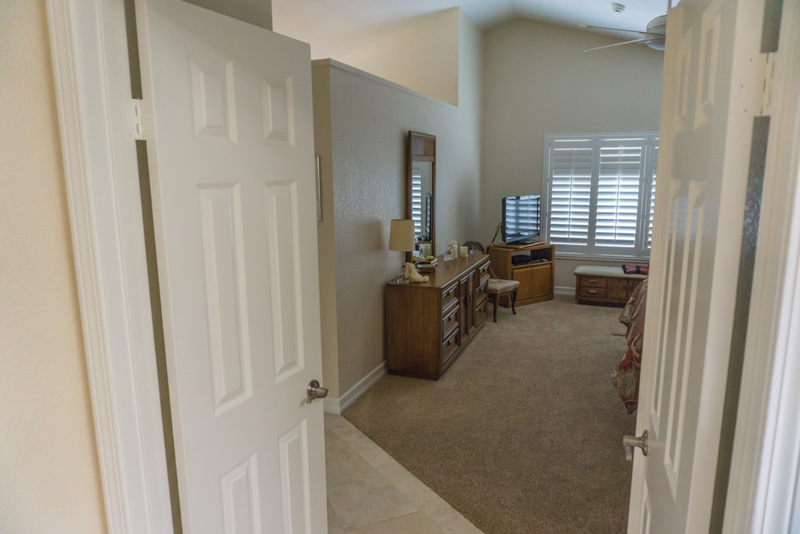 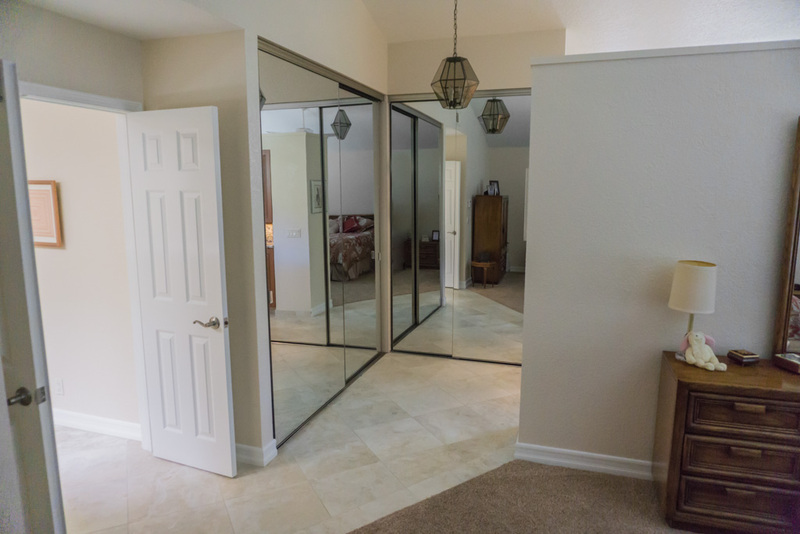 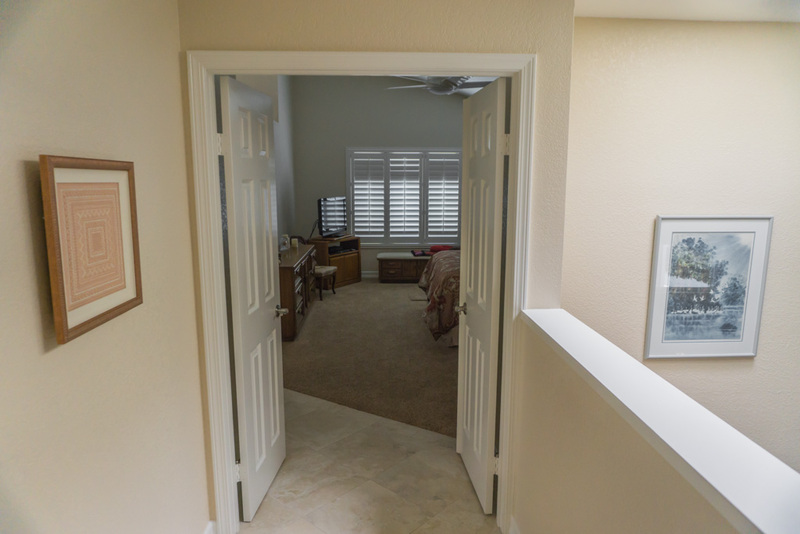 The large format 18” x 18” porcelain floor tiles with tile base board extend out of the master bath, through the bedroom entrance and closet area, and into the upstairs hallway. 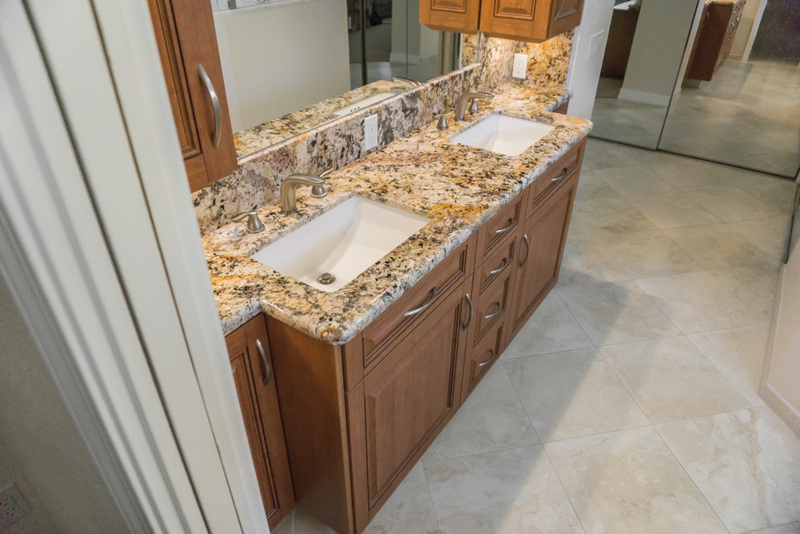 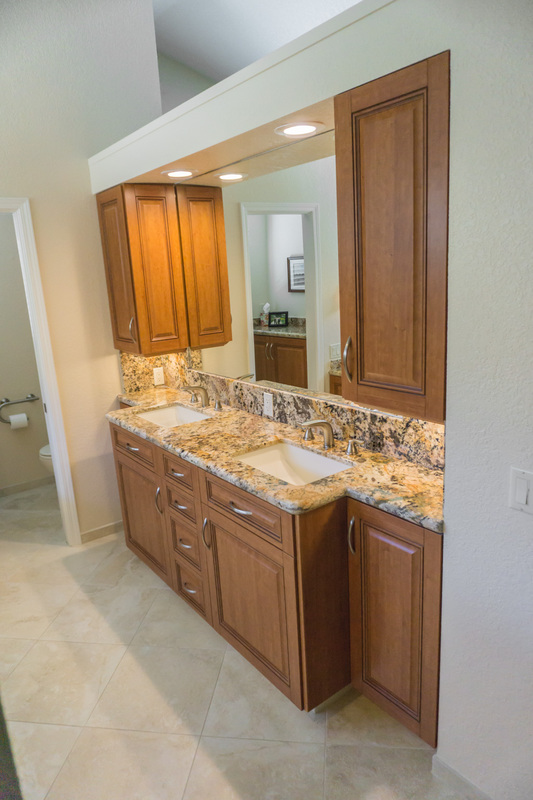 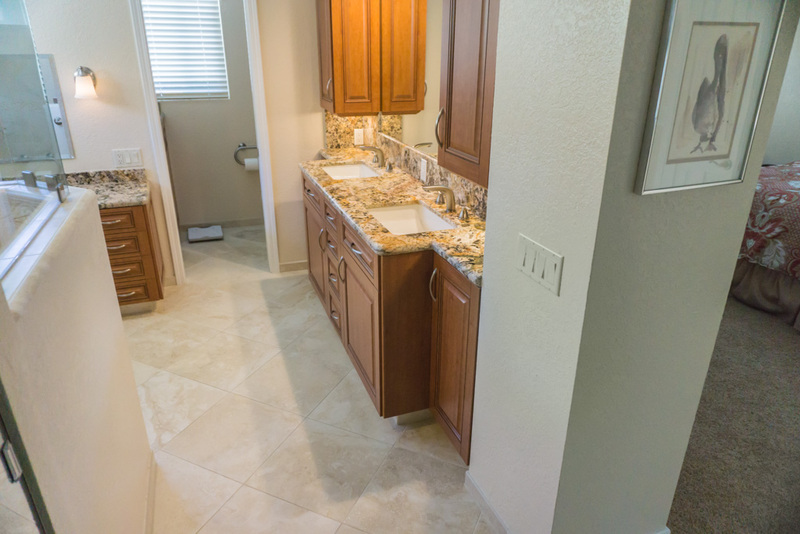 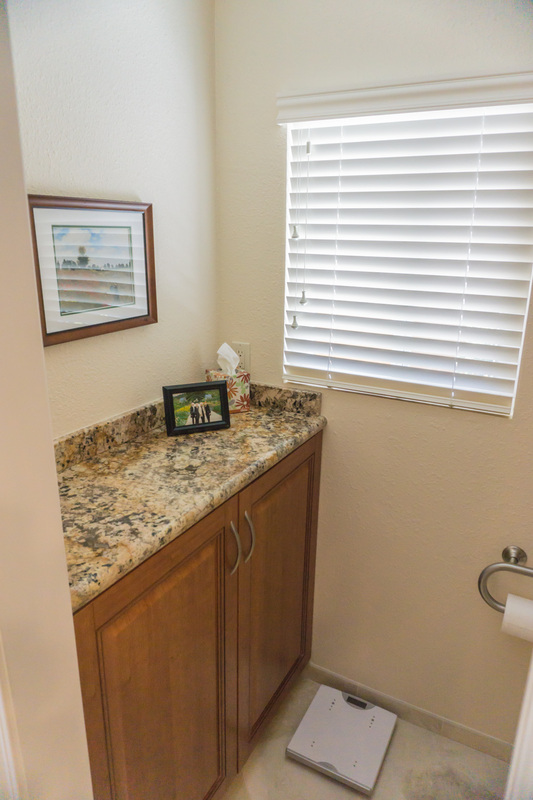 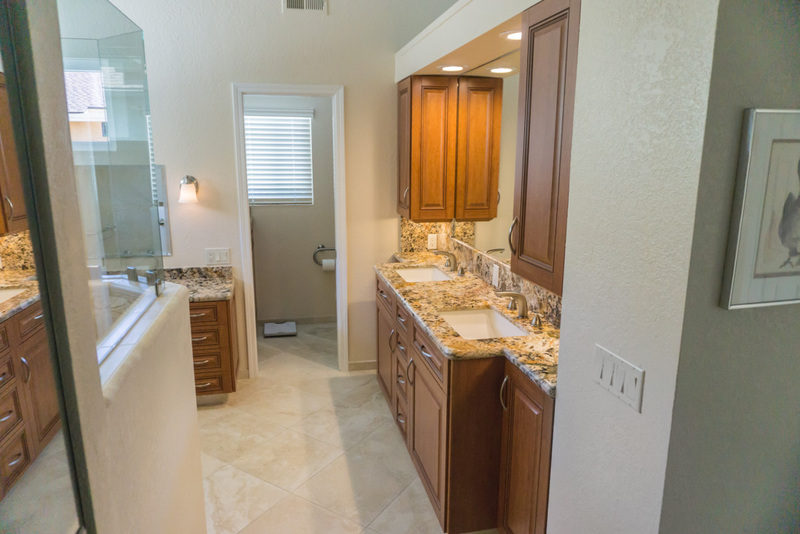 The existing cabinets in the hallway were refaced with the same doors as the bath’s and a new laminate top was installed on them that looks like stone. 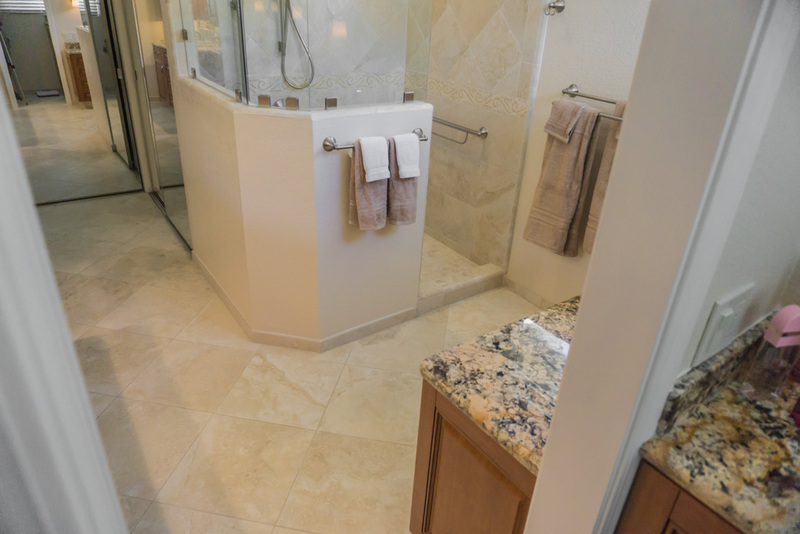 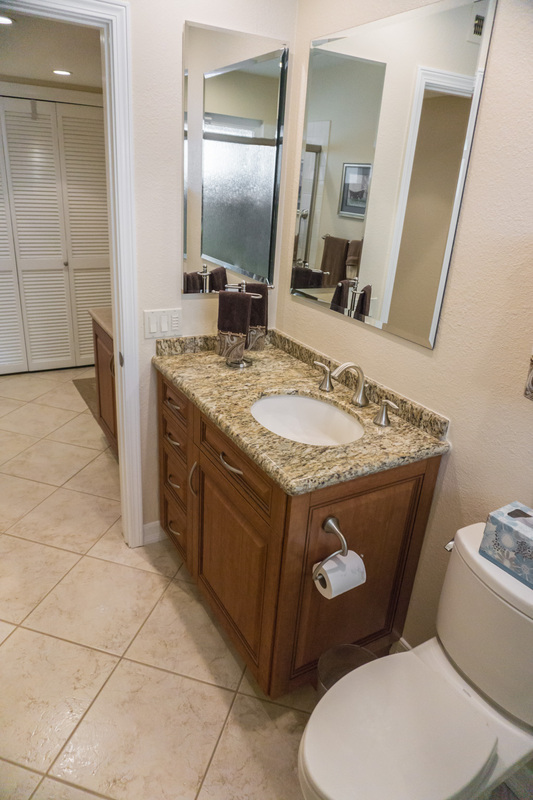 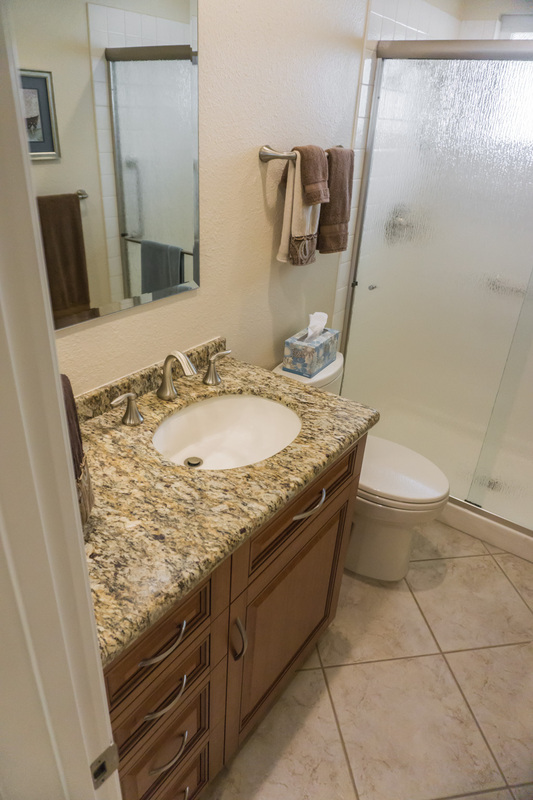 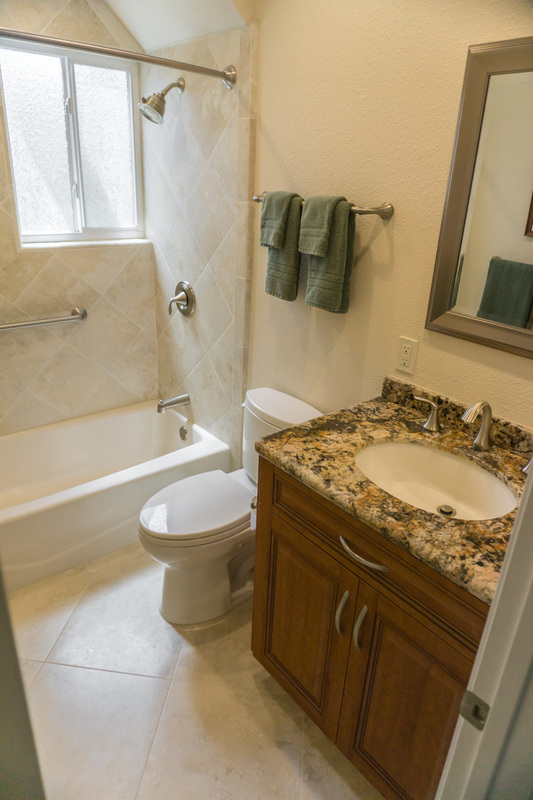 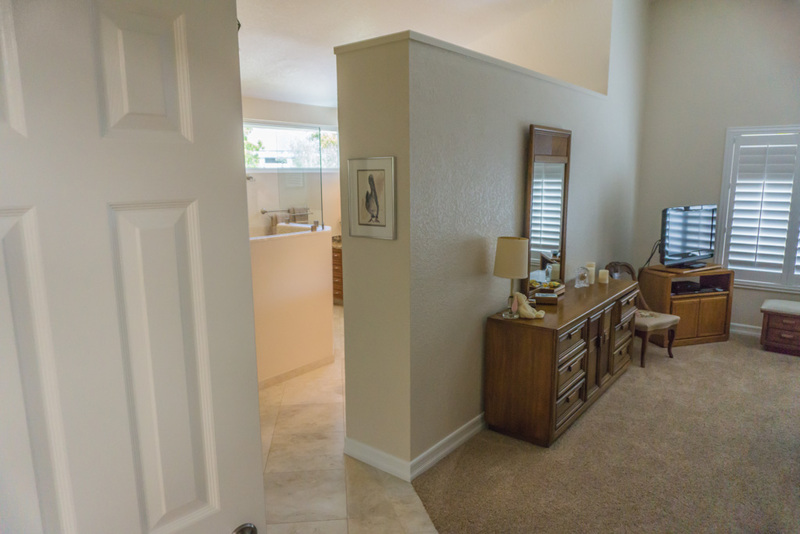 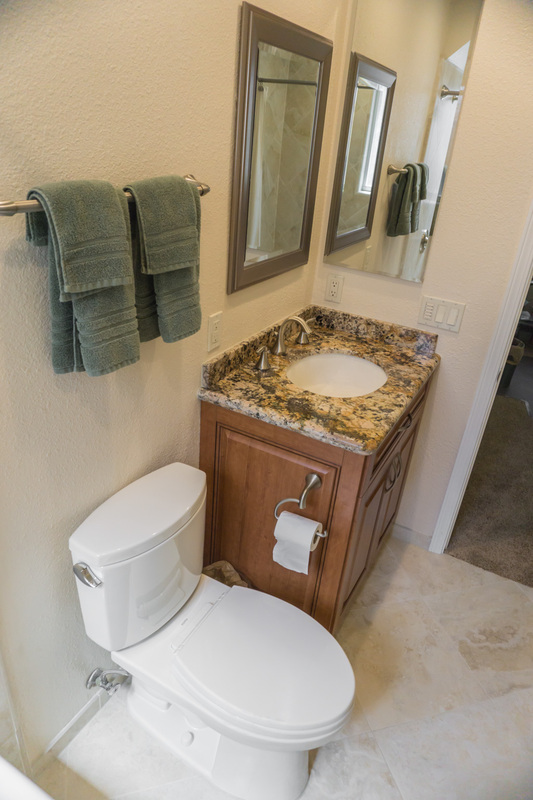 The second upstairs bath was given new tile walls, new cabinets, sink, countertop and tile flooring, while the downstairs bath got new cabinets and a countertop but kept the existing flooring and shower. 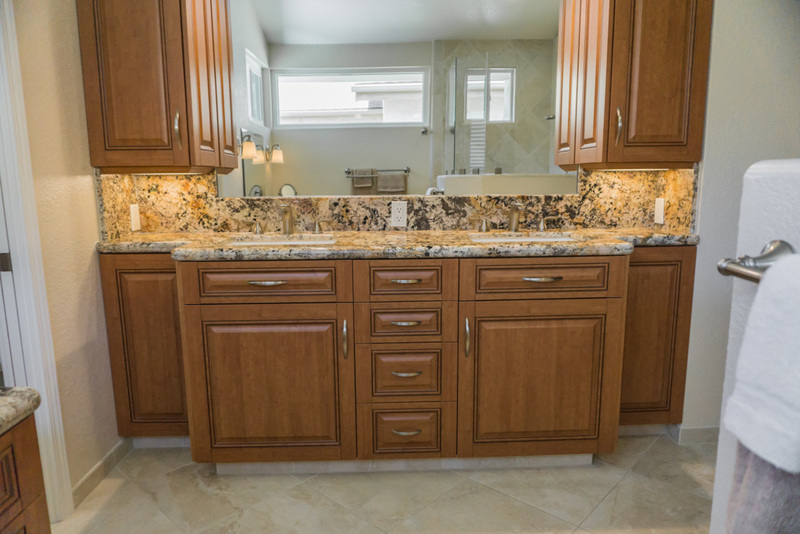 The cabinets outside that downstairs bath were also refaced in the same door style to match and also like the upstairs hall cabinets a granite colored formica counter top was installed to save money. 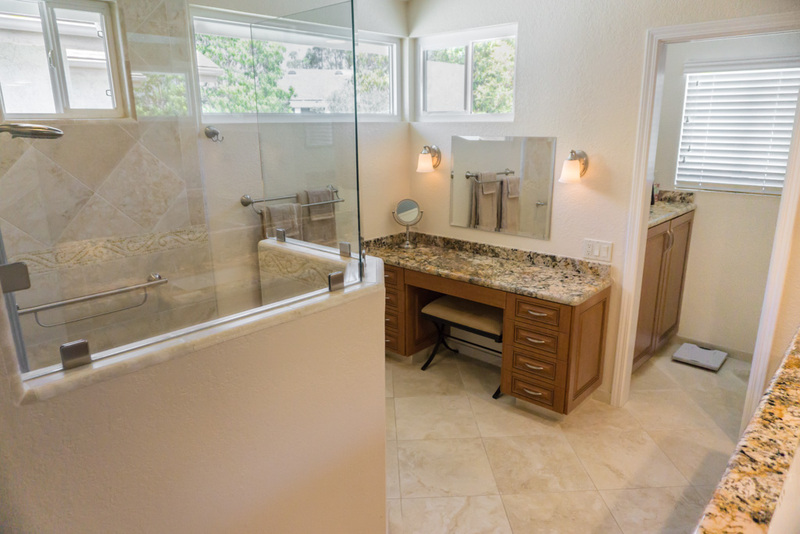 All the baths had new LED lighting throughout on dimmer switches. 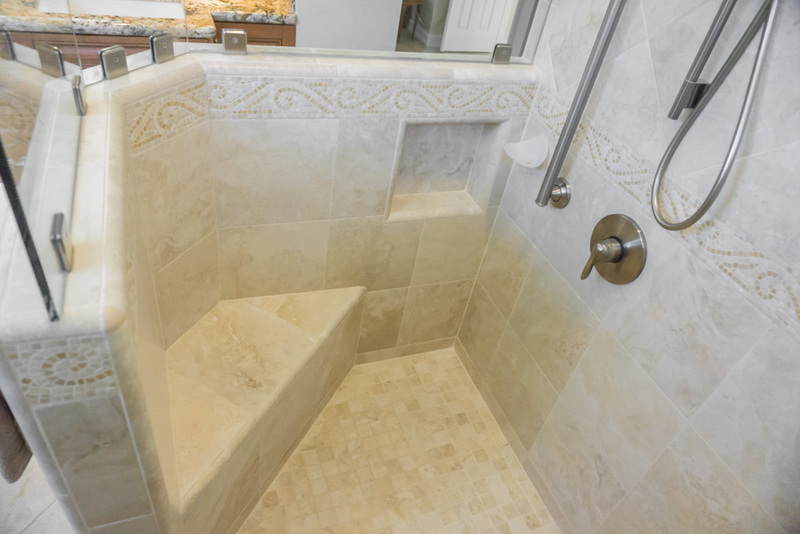 Read my website Functional Bath Design section to learn more about how and why we do baths the way you see them in our gallery.